For the above images (left the Sprite 35 Mk 1 and right the Sprite 35 Mk 2), plus some of the other pictures below, I'm indebted to Richard Dixon who has a lot of his camera photographs on this web site. 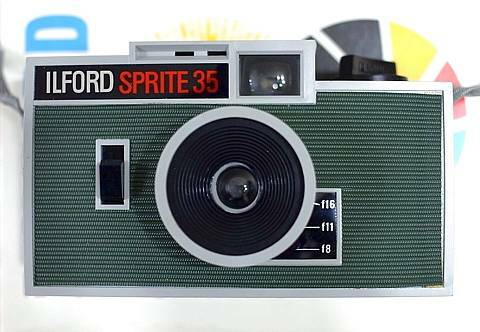 The Sprite 35 was a cheap 35mm camera with an unusual, yet attractive, coloured & grey plastic trim. The simple lens had three aperture settings, f8, f11 & f16, selected by aligning a small lever to the right of the lens surround. It had a film advance lever wind and a black twist knob for film rewinding. Some body and lettering colour variations seem to exist, but are difficult to verify. It appeared around 1964 and seemingly continued on sale until at least the end of 1967. At some time during it's life, it had a frontal face-lift (as the version alongside and to the right, above), which has been designated the Mk 2 version. Notice the different colour and type-face of it's name alongside the viewfinder. Other changes were that the 'f' aperture numbering scale alonside the lens was re-orientated to make it easier to read (a Mk 1 scale is show alongside) and some knurling was incoporated into the lens surround (see the Mk 2 image above). Strangely, the Sprite to the immediate left of this text has the first two changes but not the knurling, but this is of no disadvantage as the lens surround is fixed; the knurling seems to be just a styling feature. 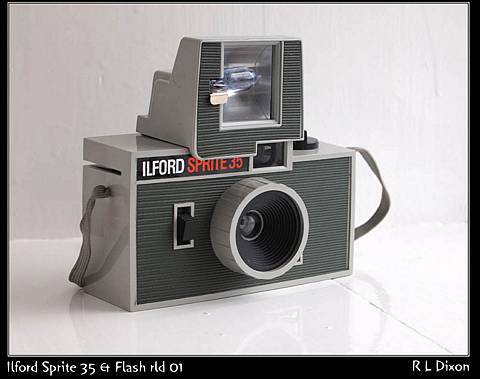 Its probable that the Ilford Sprite 35 was made by Agilux, of Croydon, as a near identical camera is known to have been sold as the Agiflash 35 (scroll down to view). The Sprite 35 was also sold as the 'Wards econo 35', presumably by the US chain store Montgomery Ward. Also see. To view the Wards 'econo 35' scroll down the page. The image of the 'econo 35' was sent to me by Phil Sterritt. The exposure counter is the small red window to the right of the viewfinder. 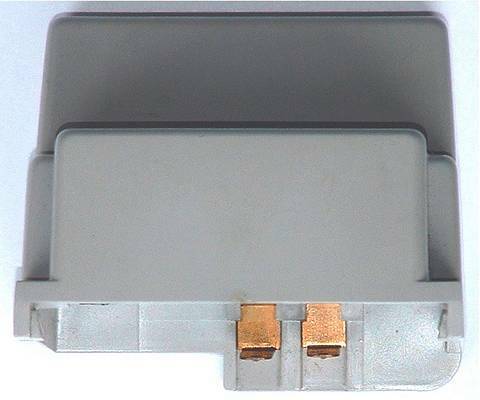 The wind-on lever is operated to the full extent of its travel until there is a 'clcik' as the shutter release button springs upwards to the top of its front slot. The shutter has then been cocked and the camera ready to take a picture. The wind-on lever cannot be operated again until after a picture has been taken. The Sprite 35 with the back removed and its flashgun in place. The film path has the usual curve to help correct 'curvature of field' of the simple lens in the longitudinal plane. for the original of the picture shown left and below. The instructions came as a simple 'fan-fold' sheet. 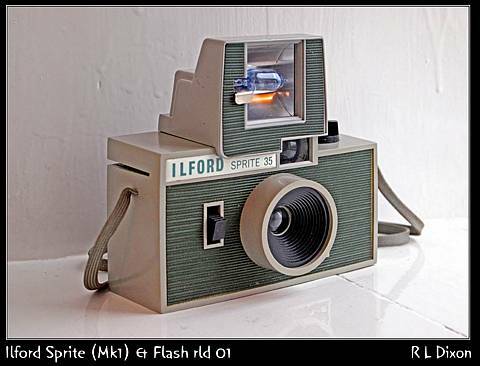 The Sprite 35 had a dedicated separate flashgun. 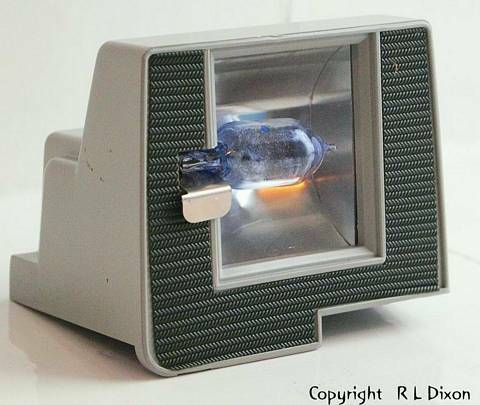 The flashgun came in a separate box, as shown here, alongside the camera's box. It would have been purchased as a separate item and was still advertised as such in the Amateur Photographer magazine 'Lighting & Flash Guide' for 1st Nov.1967. It was priced 18s.9d (94p) and took AG1 type flash bulbs. 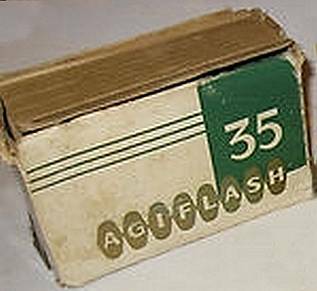 The flash would have been kept in your gadget bag (or pocket) until wanted. Synchronisation was achieved when the flashgun was plugged into the camera top (see the two openings to the left of the viewfinder front opening, below). 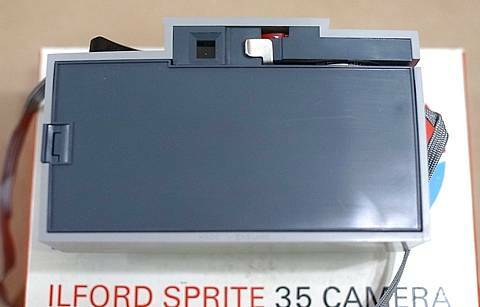 My thanks to Andy Holliman and to Richard Dixon for the following notes and pictures of the Sprite 35's 'unique' flashgun. "Unique" because it cannot be fitted onto any other camera and also unique in its design. 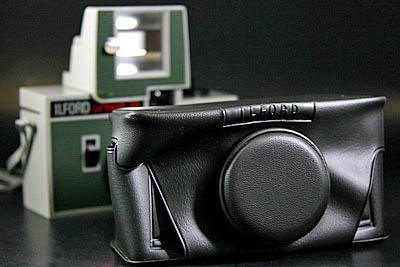 The front of the flash gun has the same trim as the body of the camera. The protruding 'sprung' bright metal latch holds the flash bulb in place and also, by pressing downwards, allows the bulb to be easily removed when used (and still hot). 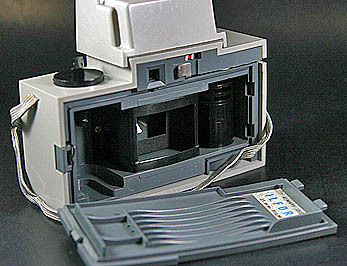 The edge of the plastic to the side of the camera's viewfinder housing are angled slightly (like a dovetail joint) to allow the flash head to slide on to the viewfinder top, with the electrical contacts being made and the flash gun held securely in place. Above can be seen the rear view of the flashgun, showing the two copper contact strips which engage with the openings alongside the camera's viewfinder. 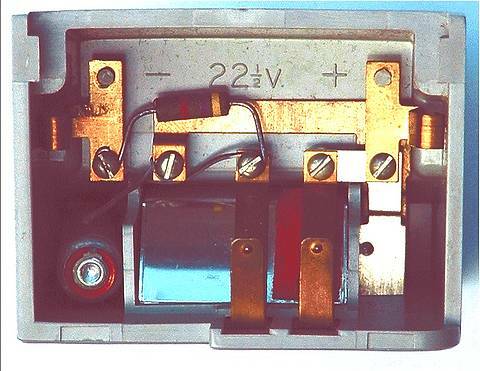 The underside of the flashgun, showing its capacitor and the place to insert its 22.5volt battery. This access is normally covered by a sliding piece of stout card, see picture opposite. 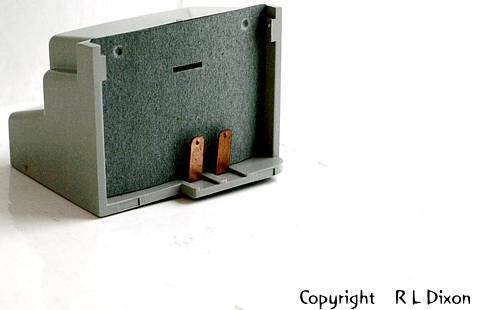 Richard noted that this cardboard cover was mentioned in the flash gun's instructions and sent me a picture of the relevant part of the instruction leaflet, see below. 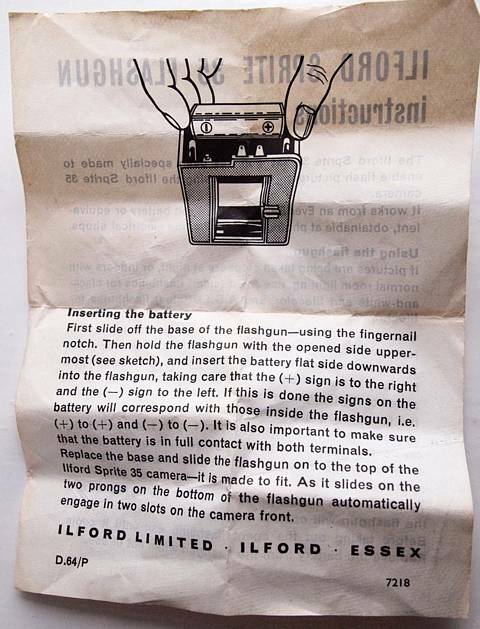 The flashgun instructions have the date code D.64/P in their lower left hand corner. The D.64 indicates the leaflet was printed in April 1964, but the meaning of the 'P' is unknown. 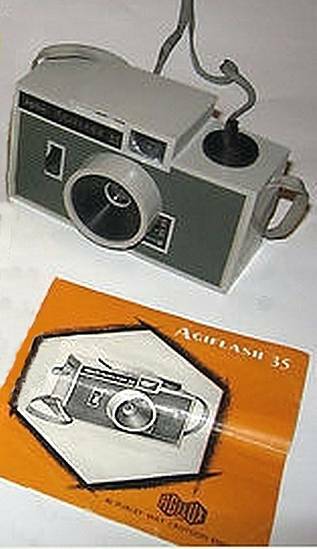 The Agilux Agiflash 35. Manufacture in Croydon, England by AGI Agilux. 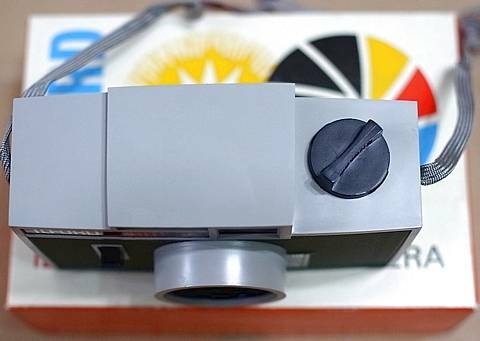 Agilux manufactured a number of simple plastic cameras that were rebadged by other manufacturers. 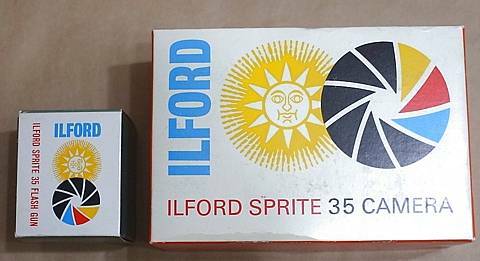 These include the Ilford Sprite and the Ilford Pixie. 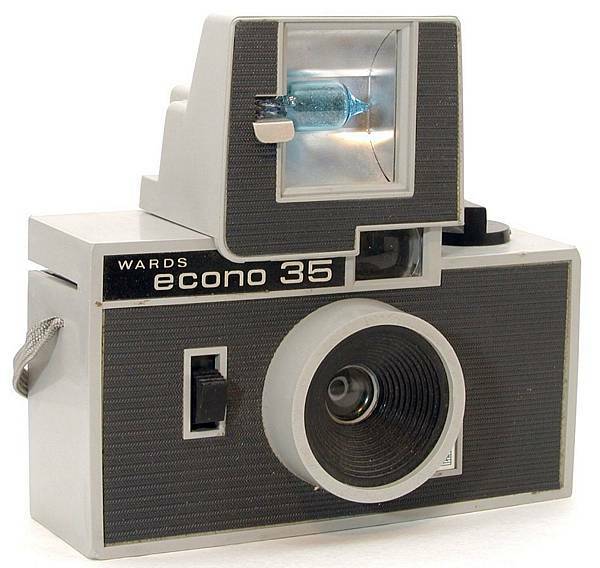 Wards 'econo 35' - picture by Phil Sterritt.